Casa Manel Felip is a building located in Ausiàs March street, number 20, the block was known as the “golden zone or textile zone”, and became wealthy at the end of the 19th century when the bourgeoisie, artists and liberal professionals who mixed with textile manufacturers moved there. The building is a prime example of the innovative ideas of the time, led by Lluís Domènech i Montaner, defender of the architecture known as “complete, noble and integrating art” and promoter of the revitalisation of artists. Telm Fernandez i Janot was born in Barcelona in 1855, he died in 1926. He graduated from the Barcelona School of Architecture, where he started studying in 1873. He served as the Municipal Architect of Sant Gervasi de Cassoles. He worked on religious buildings such as the Reial Monestir de Santa Isabel, but was contracted by the city’s bourgeoisie and carried out works such as the house of Modest Andreu on Ali Bei street and the Mundó family on Passeig Sant Joan. Fernández had already worked for Manel Felip during the construction of the residential house on the same street, Ausiàs March number 16-18, in 1899. In 1901, Manel Felip decided to purchase the next plot in order to construct a new building where he would live. Manel Felip i Sintas commissioned the construction of the building from the architect Telm Fernandez. 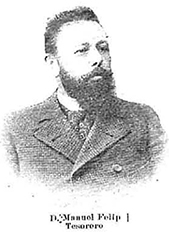 Born in 1858, he was the son of Bonafici Felip i Badia and Maria Sintas i Parpal. Felip’s father was originally from Cardona and was involved in textiles. Following the family inheritance, he also devoted himself to textiles, specializing in wool and cotton. He married Elvira Perez Capdevila, the family which owned the textile company Enrique Perez y Germans. 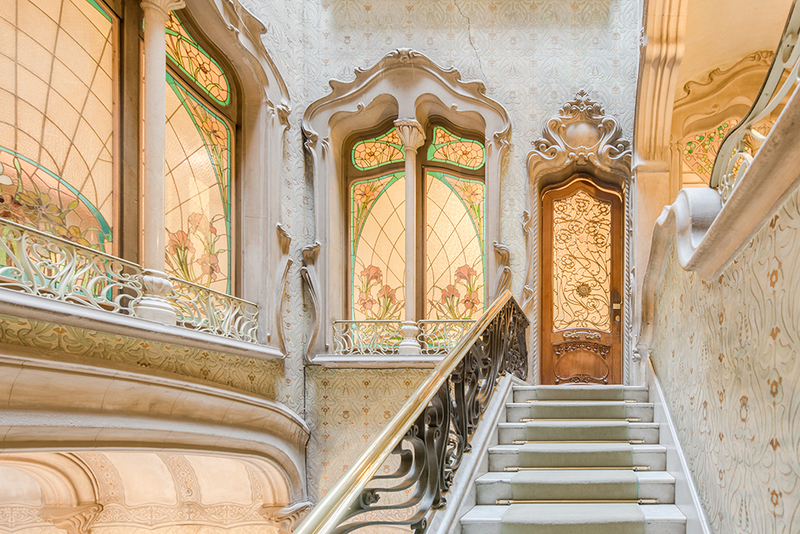 In 1905, he commissioned Telm Fernandez i Janot to build a building on land that he owned in the Eixample as a family residence. The couple went to live in the main floor of the house, at Casa Felip. The marriage did not produce children, and upon the death of Manel Felip on the 2nd of February, 1913, at the age of 55, his sole heiress was his wife Elvira, who died in February 1936. Upon the death of Elvira, without descendants, the Felip House was inherited by her nephews, and in 1975 was acquired by the Salesian Brothers of Tibidabo. Five years later, the textile company Noguera i Vintró was installed on the main floor, and in 1990 it became the headquarters of Cercle Comtal. Finally, in 1997, the former residence of the Felip family was acquired by Mr Antoni Vila Casas, pharmaceutical entrepreneur and collector of contemporary art. 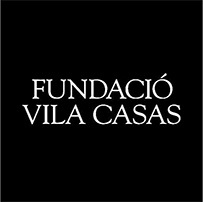 After the significant restoration of the main floor under the direction of Joan Llopis, Mr Vila set up the offices of the Vila Casas Foundation, created in 1986 to promote Catalan contemporary art. 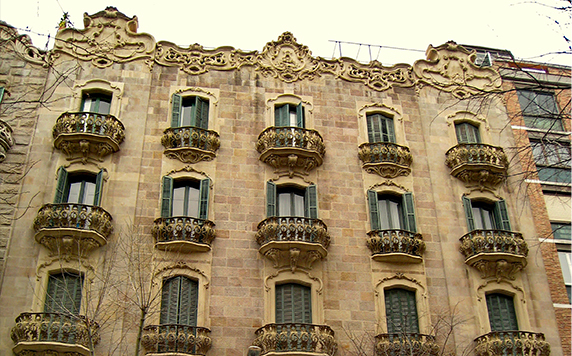 Casa Felip is a building located in the Eixample district of Barcelona that bears the name of the person who commissioned its construction, Manel Felip i Sintas. It is a building that consists of a ground floor and five floors created in the modernist style. It was constructed between 1905 and 1913 and is located next to another of Telm Fernandez’s buildings, also commissioned by Manel Felip. 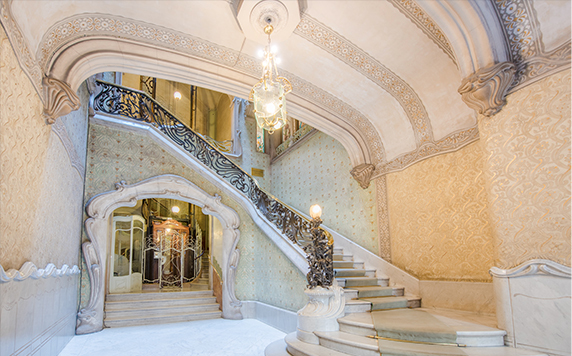 In fact, Felip owned lands in the Eixample and in 1901 he commissioned the architect to build a building at number 16 of the Ausias March street. Happy with the result, in the surrounding land that he also owned, he commissioned a new building where he went to live with his wife Elvira on the main floor. It is made up of a basement, ground floors, main floor, three further floors and the rooftop. The service, the chauffer and the doorman occupied the rooftop. The innovation of the period was to eliminate the ground floors and take advantage of floor-level space for commercial establishments. The applied arts at Casa Felip play an important role in the interior of the building. The façade has a symmetrical approach with five balconies on the higher floors and three balconies and two tribunes on the first and main floor. The central front door, and two further doors at the sides, which lead to commercial premises. The symmetry ends with the balconies and tribunes, as well as the ornamental elements that create a marked contrast between the flat façade of ashlar with Montjuic stone. The tribunes are enclosed in glass and ornamented with undulating and meandering motives of naturalist inspiration. 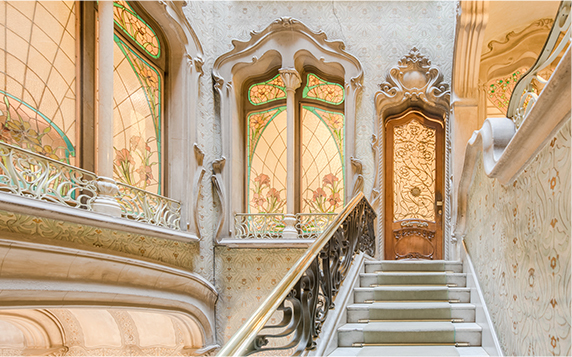 The set of corbels in a renovated Rococo style created to be admired from the street are highlighted, and the crowning of the building in the form of whiplash curves (coup de fouet). The layout of the lobby is that of grand mansions, with a main staircase for the owners and another for the neighbours. The large plaster arch stands out which leads to the second stairway, the lift and the doorman’s booth.<br /> The walls are decorated with stucco and sgraffities, portraying various floral patterns and a colour spectrum of ochre and green tones. It is most probably the work of Joan Paradís. The residence was created around a central patio that separates and differentiates the two parts of the house: the reception part which looks onto the Ausiàs March street, and the family part which leads onto the interior patio. Passage through the house takes place on a white marble floor with a discrete plant-like border.<br /> The entrance door to the flat is made of oak decorated with floral work made from cast iron and translucent glass. The central motif of the door is a sunflower, associated with the constant love and admiration of God, but also with the possible American origins of the family’s wealth. There are also sunflowers painted on the ceiling throughout the home. Created in accordance with the historicist trend of Romanticism. The wainscot is made of walnut with cast iron arches and is of a neo-Gothic style, like the large window in a flamboyant Gothic style with stone interspersed with stained glass flowers and leaves with the initials of Ave Maria in the centre. A marquetry floor with a geometric design made of fine woods, most probably the work of Eusebi Busquets, the decorator of the house. Situated on the façade of Ausiàs March is the visitors room. It is of a Rococo style, has been renovated and is quite different to the family sitting room. This change in style was quite normal at the time. The space could be described as flamboyant, with the intention of copying the 18th century French aristocratic rooms which served as a model for the palatial quarters of our country.<br /> The floor of the quarter is geometric with boxwood, birch and walnut marquetry in three colours. The room is divided into two quarters by an arch that descends in pillars and columns made of Carrara marble and capitals decorated with golden vegetation and leaves. We can relate the themes represented on walls and ceilings with music where the characters are, again, female figures. The service passage portrays a different decorative style with more simple and schematic designs inherent to the Arts and Crafts movement. In front of the service door there is a large window in the shape of a butterfly. A door leads to the kitchen and the service quarters, with a lower ceiling. This is accessed through two doors which combine cut wood with vegetative patterns and translucent stained glass featuring floral themes. The living room/dining room was intended to be a private space, the original furniture was made by Joan Busquets and is currently in the hands of the Pinós family in the Modernist Museum of Barcelona. In this space, the widest variety of craftsmanship and modernist elements in the building are found. The room leads to the back of the building and provides access to the garden. The ensemble is proof of the presence of a coordinator or decorator, Eusebi Busquets. Lambert Escaler i Milà (1874-1957) is the artist behind the figurative representations in the living room. He was a successful artist who created female figures made of polychrome terracotta. His works are inspired by artists such as Alphonse Mucha, creating female figures with wavy hair surrounded and animated by moving plant stems. Lambert idealised the female body as a symbol of beauty. Creator of the fireplace in the living room, he used a female figure to represent winter; the cold that is overcome by the heat of the home. Both sides, on the platforms that complete the doors, there are some female representations that elude to the virtues of women. 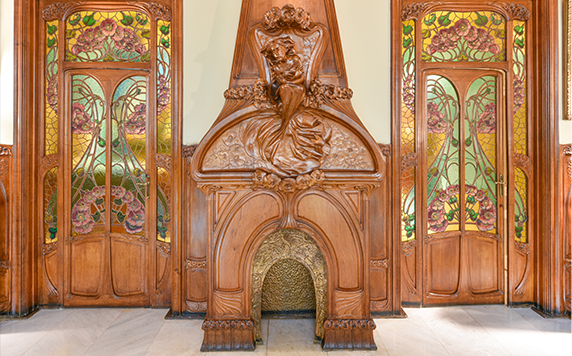 The fireplace opening features metal reliefs, and a wide wainscot with two lengths made of cut wood with floral patterns and a rich ceiling border sculpted with roses and leaves painted in gold. The living room is joined to the bedroom which has a gallery, a dressing room which is separated by a stained-glass sliding door and a bathroom. The bedroom combines elements of a French Rococo style feel with modernist ornamentation. 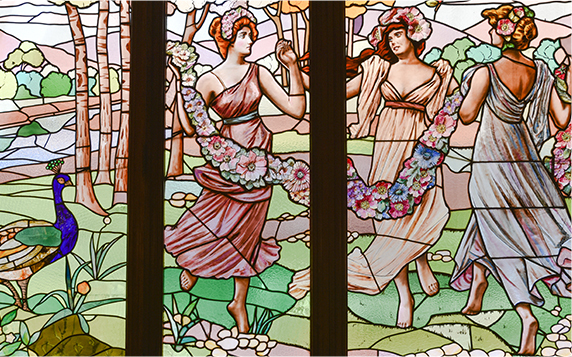 The window in the bedroom is designed to let in light, therefore the stained glass with flowers and fruit occupy the upper part. It has 5 exhibition spaces in Barcelona, Torroella de Montgrí and Palafrugell. They are all located in emblematic buildings where the private collection of the owner is exhibited. The first space and current headquarters of the Foundation since 1997 stands on the Ausiàs March street in Barcelona. Vila Casas recovered the main floor of the building known as Casa Felip, a modernist building. In 2004 he acquired the ground floors and basements of the next house, number 22, to open up exhibition rooms. According to Vila Casas’ premise: “Tradition and culture are the core ideas or identification signs of our country”.